The 30 Minute Rule Is Gone! There is a currently a problem with the NSAI database which means users can't download standards from the site. You can still search the database, and view standards on screen, but just not download them. Just fill in the form including the name of the standard and any other relevant details, and we'll get NSAI Tech Support to forward on the standard as a temporary solution. The open access movement is the worldwide effort to provide free online access to scholarly research literature, especially peer-reviewed journal articles and their preprints. Over the last decade there has been dramatic growth in open access resources with many thousands of articles now freely. Our listing provides a guide to the major scholarly open access resources, repositories and directories. We have selected scholarly open access resources on your behalf and made them discoverable through the Library Catalogue. Choose ‘Including Articles’ from the drop down and your results will include open access resources as well as our subscription services. Open Library of Humanities : supported by the seven Irish University Libraries, this is a gold open access publisher for the humanities. Currently features 10 journals in the broad humanities. BioMed Central : 220 open access, online, peer-reviewed journals. Elsevier Open Access Journals : link to open access journals on Elsevier. Open Biology : published by the Royal Society. Open Humanities Press: peer-reviewed open access books and journals in the humanities. Oxford Open Journals :link to open access journals and articles on Oxford Universities Press. PeerJ : open access for Biology and Medicine. Public Library of Science (PLoS): a non-profit publisher of peer-reviewed journals including PLOS ONE and PLOS Biology. SAGE Open :open access articles on the social sciences. Wiley Open Access journals :open access journals across biological, chemical and health sciences, including Ecology and Evolution. DOAJ: Directory of Open Access Journals : an online directory that indexes and provides access to high quality, open access, peer-reviewed journals. DOAB: Directory of Open Access Books : a directory of academic peer-reviewed books from many publishers. OpenDOAR: Directory of Open Access Repositories : provides access to academic open access repositories from around the world. ROAR: Registry of Open Access Repositories : promotes the development of open access by providing timely information about the growth and status of repositories throughout the world. ROAD : UNESCO funded project to create a directory of open access publications, including journals, conferences and annual volumes. aRxiv : open access to e-prints in Physics, Mathematics, Computer Science, Quantitative Biology, Quantitative Finance and Statistics. CORE : 20 million articles worldwide, including pre-publication version of journal articles, book chapters, conference papers and theses. You can limit your search to full text articles and if an article is peer reviewed this is specified. Google Scholar : the most common way of locating open access materials. Often a pre-print of the article and the publisher's version will appear in the search results. PubMed Central : contains open access subset of biomedical and life sciences journal literature. Palgrave Connect: Open access chapters and books. See booking link and details below of event next Thursday 27 October. THU, 27 OCT 11:00 A.M. This session will give an overview of Open Access Publishing (Green and Gold), University Policy on Open Access to Research Outputs and the benefit of making your publications available on the ARAN repository. This event marks Open Access Week, a global event now entering its eighth year, is an opportunity for the academic and research community to continue to learn about the potential benefits of Open Access, to share what they’ve learned with colleagues, and to help inspire wider participation in helping to make Open Access a new norm in scholarship and research. The Library is providing trial access to the Ovid Emcare database until December 13th. This resource is primarily aimed at professionals involved in Nursing and Allied Health research. Access the Emcare trial via the Library Database Trials page. More than 70,000 preferred terms in EMTREE, expanded with nursing and allied health terms. All mapped to MEDLINE’s MeSH. Further information about Ovid Emcare. You may have other topics too and this is the place to share and discuss them. The forum will inform the initial development of services to help researchers meet the challenges of managing datasets. Please come along, participate or listen, and enjoy lunch with interested colleagues. All are welcome. 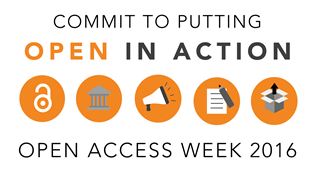 Along with libraries around the world, the James Hardiman Library at NUI Galway will be celebrating International Open Access Week the final week of October, from the 24th - 30th. The theme for the event this year ‘Open in Action’, which puts a spotlight on the concrete steps that are and can be taken to open up research and scholarship, while encouraging others to do the same. Access Week. You can sign up, for example, for two key events that we’ll be holding on the theme of Open Access. The library provides access to a wealth of Open Access resources already, many of which you’ve probably used without know it! 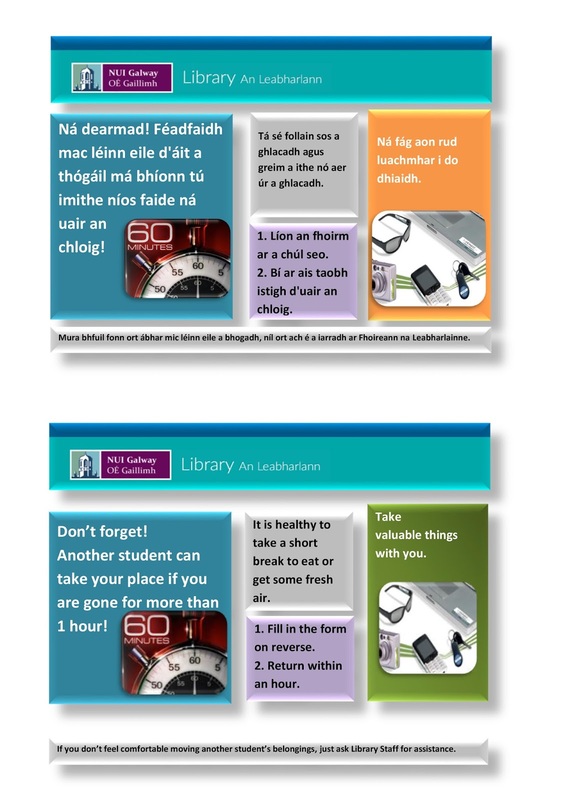 We’ll be promoting these resources throughout the week, simply by Tweeting and Facebooking about what they are. 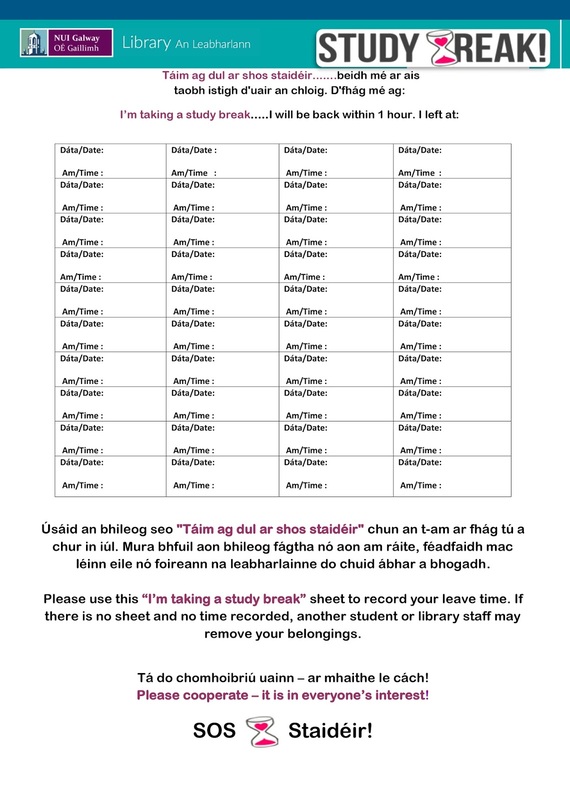 Follow our Twitter account, @nuiglibrary, the Hardiblog and/or our Facebook page to find out more throughout the week. 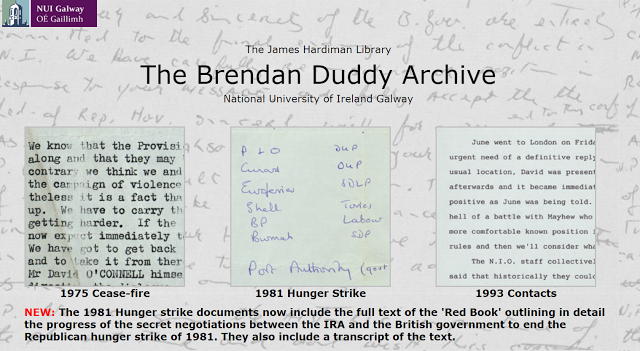 On Tuesday 1 November, NUI Galway Library will host a lunchtime event focusing on Digital work underway on the Library's Archives. Our 2nd event in the series will focus on the Archive of Fear na Mapaí, Tim Robinson, which resides here at NUI Galway. This archive documents four decades of Robinson’s pioneering work in Irish landscape, which began in 1972 when he visited the Aran Islands with his wife Máiréad. His 1975 one-inch map of the Aran Islands was the first substantial map of the area to be created since the 6 inch Ordnance Survey map a century before, and its composition brought up several complexities that exist in this unique landscape, from place-names, to the geological, archaeological, and botanical features that are all inherent in the landscape. Beyond the publication of the map, he explored these subjects in a deep-mapping project of Aran, that led to the publication of two books, ‘Stones of Aran: Pilgrimage’ in 1986, and later ‘Stones of Aran: Labyrinth’ in 1995. 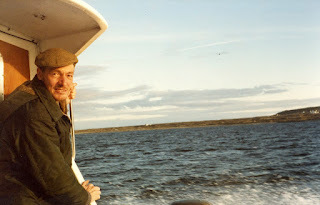 His work brought him to map and consider the Burren and Connemara landscapes with equal emphasis, and in 1987, Tim and Máiréad won the Ford Ireland Conservation Award. They proceeded in the competition as Ireland’s official entry, and won the European Award in Madrid. 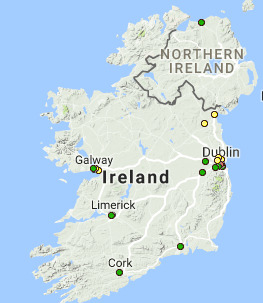 One particularly special element of Robinson’s archive is a meticulously accumulated index of the townlands of Connemara and the Aran Islands, which has inspired the Library’s first steps to a Digital Mapping project, focusing on Robinson’s archive, but with applications to future projects. This will be the focus of our inaugural Brownbag Pitch. As the name suggests, lunch will be provided, and we will take you through the story of the archive, the digital project, and plans for the future, before opening up the floor to some discussion about what parts of the project you consider useful, not useful, and if you think this has applications to your own research. Everyone is welcome to the pitch, and registration is free, but for catering purposes, we would request that you please register, with details of how to do so to follow soon. 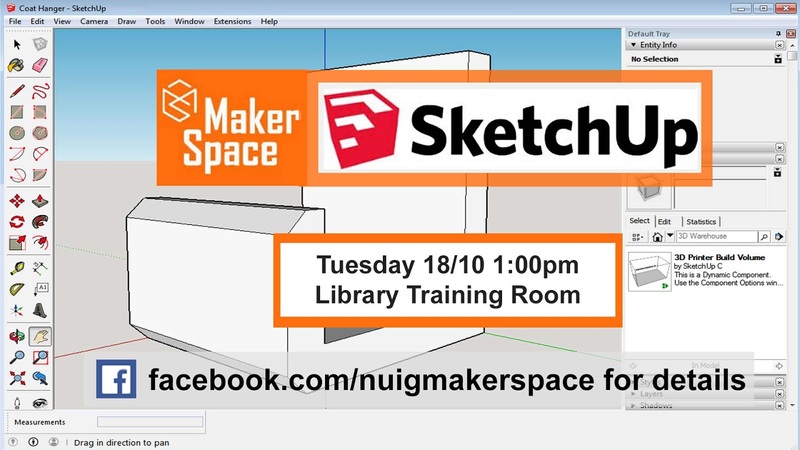 Learn how to create 3D printable objects using the SketchUp Make software. 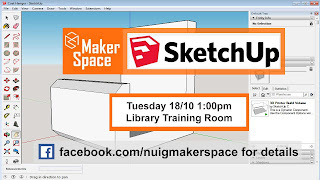 SketchUp Make is an easy to learn, intuitive and powerful 3D drawing tool. After this 1-hour workshop you will be able to create 3D objects and ready to move on to using the more advanced features available in the software. 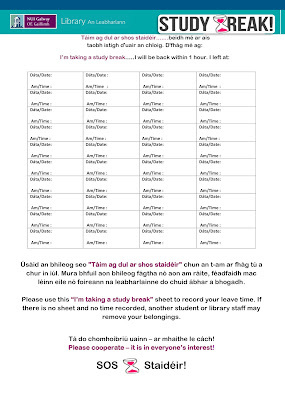 The sofware is available for free download and also in the pc suites throughout the NUI Galway campus. The workshop will be held in the library training room which is located just past the Maker Space. For the next year we now have access to UptoDate Anywhere, a mobile version of the resource which can be accessed on mobile phones and portable device. Persistent login: You only need to log in once – the app saves your credentials to save you time. Bookmarks and search history: Easily locate previous searches and save topics you visit often. Calculators: More than 165 medical calculators support quick, informed decision-making. Before you download the app, an initial account must be created on campus using the campus network. For more details on registration please see the following instructions. More information on UpToDate is available from the Library website. Access to British Library Newspapers, Part 1 is now available via the Library website. This new online resource provides fulltext access to the full runs of national, regional and local nineteenth century British newspapers, taken directly from the extensive holdings of the British Library. It includes 47 titles, totalling approximately 2.2 million pages. The collection is made up of daily and weekly publications.